(From Sigma lens literature) This telephoto zoom lens has a large maximum aperture of f/2.8 which remains constant throughout the zoom range and it is optimized for digital SLR cameras. Two pieces of SLD (the special low dispersion) glass in the front lens group and another two in the rear group offer excellent correction of chromatic aberration. High optical performance is demonstrated throughout the entire zoom range. Color aberration in the secondary spectrum is compensated by using two pieces of SLD (the special low dispersion) glass in the front lens group and another two in the rear group. This lens exhibits superior image quality. The Hyper Sonic Motor (HSM) ensures a silent, high-speed AF function as well as full-time manual focusing capability for Sigma, Canon, and Nikon mount lenses. The lens can be used with the 1.4x EX or 2.0x EX APO Tele Converters (optional), becoming a 98-280mm f/4 Autofocus telephoto zoom lens or a 140-400mm f/5.6 Autofocus telephoto zoom lens respectively. NOTE: Sigma makes a newer version of this lens with improved macro capability. Sigma has a reputation of producing good lenses at low prices, but with the advent of some of their newer, more expensive optics, they're extending that game plan to the production of very high-quality optics at "reasonable" prices. This 70-200mm f/2.8 macro zoom is one example of this. As we'll see, this is an excellent lens by any measure, and its roughly $800 selling price constitutes something of a bargain. Unfortunately though, as of this writing (in late November, 2006), we haven't tested a lot of other lenses in this focal length/aperture range, so can make only limited comparisons. Read on though, for all the details on this great telephoto zoom! On our Canon EOS-20D sub-frame test bed, the Sigma 70-200mm f/2.8 was a little soft wide open, but quickly improved as we stopped down. At f/4, it's extremely sharp from 70-135mm, softening slightly on one edge at 200mm. The slightly lopsided sharpness characteristic at 200mm decreased at smaller apertures, but some hint of it was visible all the way to f/11. At all shorter focal lengths though, sharpness was really excellent from f/4 up through f/11, where the first hint of diffraction limiting began to be felt, but was still fairly sharp at f/16. As is always the case (because of diffraction limiting), the minimum aperture of f/32 was very soft, but perhaps useful for achieving soft-focus effects. From 70-135mm, chromatic aberration was quite low, and extremely low in the vicinity of 100mm. It gets quite a bit worse at 200mm, but the average level actually wasn't too bad, as long as we stayed below f/16. As you'd expect from a full-frame lens attached to a sub-frame body, light falloff was very low, a maximum of 0.28 EV at 200mm (0.19 EV at 70mm), very quickly dropping to 0.1 EV or below one stop down from maximum. As with shading, so with distortion: Geometric distortion varied smoothly with focal length, from a maximum of 0.24% barrel at 70mm, to 0.22% pincushion at 200mm. You'll notice the distortion at the ends of the focal length range if you're shooting subjects with straight lines in them parallel to the edges of the frame, but on most subjects, it won't be noticeable. 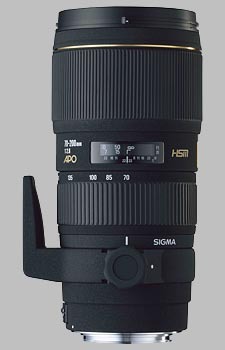 Sigma's HSM (Hyper Sonic Motor) lenses are generally fast and accurate in their focusing, and this 70-200mm followed suit. The HSM motor also means you can grab the focus ring at any time and adjust the focus, you don't have to put either the lens or camera into manual focus mode first. Build Quality and Handling Build quality of this lens seems very good: Our sample worked very smoothly, both zooming and focusing, with no play, wobble, or looseness in any of its controls. It has a built-on (but removable) tripod mount that gives it a very good balance on a tripod with most bodies. It was just slightly back-heavy with our test bodies on it, it'd probably be just slightly front-heavy with a small body like the Rebel XTi, Nikon D40, or smaller Pentax DSLRs attached. Regardless of relative body weight, the balance is such that relatively little torque is applied to the tripod's mounting threads. This lens is an internal-zoom, internal-focusing design, so the lens doesn't change length as you zoom or focus, and the front element doesn't rotate, very convenient when using a polarizer or graduated neutral density filter attached to the front. It also showed no tendency whatever toward "zoom creep" when hung pointed down, as when suspended from a neck strap. Overall, a very nice, smooth-working lens that was a pleasure to use. One note though: This is the non-macro version of this lens, a newer, macro-capable model can focus much closer, down to 100cm, vs the 180cm this model can attain. As of this writing in late November, 2006, we've tested only two other lenses having the same focal length range as this one, only one of which shared its f/2.8 maximum aperture. We can thus make only limited comparisons between this model and others on the market, but hope to flesh out our test data in this focal length range more in the future. Against the Canon 70-200mm f/4L USM, the Sigma does pretty well, particularly starting at the f/4 aperture they both share. In other parameters, they compare pretty closely, and are pretty close in price as well, the Canon actually being a bit cheaper. Between the two, if you're on a Canon platform and don't need the f/2.8 speed of this Sigma, the Canon is a better deal. (If you do need the f/2.8 though, the Sigma delivers quite nicely, at only a modest increase in price. Against the Nikon 70-200mm f/2.8G ED-IF AF-S VR, the Sigma is outclassed at f/2.8 across most of the focal length range, pulling ahead just slightly at 200mm. Drop to f/4 though, and the tables are turned, the Sigma winning the sharpness derby handily. The Sigma also wins on vignetting and distortion, albeit by narrower margins. The main differences between these two lenses come in the Nikkor's VR (vibration reduction) technology, and dramatically higher price point. For handheld available-light photography, the Nikon's VR gives it a really sizable advantage, but if you can get by without VR, the Sigma will save you something on the order of $600 when comparing typical street prices. While we've tested only a few lenses in its focal length/aperture range, we can say that the Sigma 70-200mm f/2.8 competes very strongly against them. It's a well-built, smoothly-operating, sharp, low-distortion lens. At a street price of roughly $800, it's not cheap, but for the price delivers a lot of capability, and good-quality images. As is usually the case, moving up to a full-frame camera, some things get better (sharpness at maximum aperture and chromatic aberration), while other things get much worse (shading and distortion). If you don't mind doing some post-capture image tweaking in Photoshop or other image-manipulation software to mitigate the distortion and shading, this lens could be a real bargain for a full-frame shooter. - And actually, when you compare its performance at f/4 (where its shading drops to about 0.5 EV) with that of the Canon 70-200mm f/4L USM, it acquits itself quite well. All in all, not at all a bad performer for its price, a good option for full-frame shooters who don't have megabucks to spend on fast optics. I had an old sample of this on a KonicaMinolta body (therefore, the version was non-HSM). It was still much faster than an old Minolta "beercan" (70-210/4), contrast was also better. Sharpness was about the same (read: very good a little stopped down). I liked it a lot, and I've heard that the new version for the Sony/Minolta mount even has HSM. With Sony having their built-in stabilizer system, this Sigma a very good purchase (as the native 70-200/2.8 costs 2.5 times more). For Canon and Nikon, it depends on whether you need stabilization. I actually DIDN'T buy this lens. I have been looking at the pro 2.8 lenses in this zoom range. Had the opportunity to mount this lens on my D200 and take some test shots. Neutral on the sample shots after looking at them at home. Absolutely wonderful lens. I had this as my main long zoom for almost two years now. I can't say enough good things about it, fast, sharp @ 2.8, beautiful IQ, Black body, balanced well on my 1-series. Alas the King is dead. I finally found a Canon 70-200/2.8is sharper than my Sigma ( I had to pixel peep to see the difference ). I only needed the IS for low light wedding and event shooting. I kept hoping Sigma would give this lens their OS, oh well. If you're not making money this is the lens to get unless you have to have IS. I've got large steady hands so I could shoot down to 1/50-60 with this lens ( I'm a excellent pistol and rifle marksman former USMC ). So bottom line don't be afraid to get this lens, you wont be sorry. I would still prefer the 70-200 4L because of better IQ and built quality (and the fact that it's not a third-party).. Plus its cheaper..
Why? Well, The Sigma 70-200 f/2.8 only gets competitive when you stop it down.. so.. most of the time you'll be using it as a f/4 lens..
excellent sharpness,solid construction, f.2,8 , tripod collar included. It's a solid, heavy lens. It gives the same optical results you can get from a Canon 70-200 f.4 (I had them both). Probably one of the best Sigma lenses. I own the first version, the new one should be even better! I purchased this lens just because it was on sale, so I could compare it with the Sigma 50-150 f/2.8 DC and the Sigma 150mm f/2.8 Macro that I already have. Stopped down, this lens is truly as sharp as lenses can get. Rumor has it that it's even sharper than the Nikon 70-200 VR at f/8. Wide open though, the Nikon definitely takes a lead, and at close distances, the Sigma definitely takes a hit. Of course if you want to do macro work then you should be on a tripod at f/4 or f/5.6 anyway, but I'm just stating the facts. Awesome lens, half the price of the Nikon. That's a fact. This is one of those great lens values that comes along and makes you re-think the amount of money you've sunk into "L" glass. I love this lens, and use it mostly for "people" shots (weddings, headshots, and sports). The bokeh is pretty smooth, the focus speed is *just* slightly slower than the Canon version (but still very fast & accurate), and the colors are very true-to-scene. I have owned this lens for the past two years and continue to be pleasantly surprised by the sharpness and quality of the images. It is true that it is less sharp shooting wide open at f/2.8, but once you stop down to f/4 it is tack sharp. Some people have also complained about variations in quality, but that wasn't my experience. When I first received this lens I was convinced that it was too large and heavy to be useful. It took about one month before I really felt comfortable with it and I haven't looked back since. I also found the zoom ring to be quite stiff at first but it loosened up just enough. The lens is very rugged. I often use it with the 1.4x teleconverter which does not detract from sharpness, but of course you lose one stop. Don't go for the 2x teleconverter, it seems to make the lens too soft. The only downside is really the minimal focusing distance. The newest version of this lens incorporates a "macro" which solves this problem. If I could I would trade this in for this newer version just for the improved versatility in close-in work. All-in-all, if you don't need VR or IS, this is a great lens. There was really one thing only that made me sell the Sigma 70-200 after only two weeks and that was the poor sharpness at f2.8. I feel it was more so at both ends of focusing range. It also displayed a faint halo around brighter objects that were just out of focus. From f4.0 and upwards everything was much better. The handling and the quality feel of it was excellent. The sturdy tripod mount was also very good, easy to detach if you needed to. Maybe I got a bad copy of it, I don't know. I had a bum copy after purchasing new, so I sent it into Sigma to have it repaired. It came back a little better, but was still bad (Not sharp at all at 2.8. It was great at f/4 and above). I found that many people had this problem with several types of sigma lenses (I also had problems with a sigma 30 1.4). I sold it on ebay. The only reason I recommend this lens is because of the number of peopl who have received good copies. I have just not had good luck with Sigma Corporation. sharp, cheap for the optical characteristics, not too heavy, good contrast, good build quality. no stabilized version, AF slower than USM. I got the Canon mount version of this lens as a good quality mid-tele for my Canon 10D. I am mostly interested in nature photography (landscape, wildlife, closeups) and travel photography (landscape, architecture, portraits). If I except the fact that this range is a little short for wildlife, this lens turned out quite good for all applications I am interested in. The most striking characteristic of this lens compared to the great number of 70-200 zooms is its price: at least 30 % less than most comparable offerings (70-200 with constant aperture 2.8). Despite its reasonable price, this lens is very good. First, the build quality is great, but the weight is still reasonable. Without collar and hood, the weight and size are even more reasonable (I could fit this lens with my 10D and 17-40 in a rather small shoulder bag "Lowepro Nova 2 AW"). It seems to be built like a tank; it does not extend while zooming or focusing, so that this lens is very nice to use. The hood works very well and protects the lens both in use and reversed, in the bag. The tripod colar is very good too, and can be removed without unmounting the lens from the camera (which Canon collars do not make possible). Most importantly, the optical quality is very good. The lens is very sharp throughout the range from f/4. At f/2.8 and at both ends, there is a noticeable decrease in sharpness, but it is still good. Contrast is good. Colors look a bit cooler than with my Canon "L" lenses. Overall, I like the optical quality of this lens pretty well. I could get very nice prints (mostly 12x8 inches) with it, even with some cropping (body used: Canon 10D). Autofocus speed is a little on the slow side, compared to Canon USM lenses. This lens could also benefit from a focus limiter (which many 70-200 zooms have). But this is a reasonable issue, given the price of the lens. Another point is that there is no stabilized version as of today, even though Sigma has at least two "OS" lenses. An OS version of this lens would be a winner (and I would probably consider the upgrade, since a 70-200/2.8 zoom without stabilization requires rather fast shutter speeds, especially on 1.5x or 1.6x cameras). I can recommend this lens strongly, since it is a very decent performer at a reasonable price. Softer at the long end. This is a very good lens. Resolution at 70mm is excellent ,very high at 135-150 mm, a little worse at 200 mm. Distortions are very low. Vignetting is very low too. Nice bokeh.The construction quality is very high. CAs are really low. AF is silent and fast. Good tripod collar. In the words of Charlton Heston, "from my cold dead hands". I shoot auto racing with the 1.4X converter and it has never misfocused a shot. The zoom was stiff as hell out of the box but it is now very smooth. This lens is so good it's better than my 6mpixel camera. Sharpness and contrast equal to my Nikon 300 f4. Even the tripod mount is a work of art. Best investment I ever made!! I've used this lens on my 20D.No focussing problems at all.This lens, if you get a good copy, is as sharp as the L at all f-stops. A great lens for sports photography. I use it primarily for soccer and basketball action shots. Images are sharp with good contrast. I also shoot with the lens hood at all times. A perfect lens for soccer and football size fields. You will need a monopod as it gets heavy over the span of a couple of hours of lugging it around. Focus times are fantastic. I never miss shots because of focus lag. I have the newer -DG model of this lens and use it with a Nikon D70. Images (portraits & outdoor sports) are tack sharp -- even at f/2.8. The lens seems to be very sturdy & very well built. From what I can tell, the HSM on this lens keeps up quite well with the Nikkor 70-200 AF-S.
Downsides: Minor issues. I would love to have VR, but this lens was half the price -- and this lens meets my needs. It _is_ heavy, but that's the "price" you pay for a constant f/2.8. Since US$750 was my limit, I also considered the Nikkor 80-200 f/2.8 AF-D, but the focusing speed was too slow for my tastes.